The government is providing additional funding to primary schools in order to improve the provision of physical education and sport. This funding is ring-fenced, meaning it will only be spent on sports and PE. 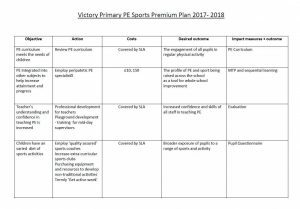 At Victory we are working closely with The London PE & School Sport Network to extend the sport and PE provision we already provide. We evaluate the impact of all initiatives undertaken to ensure the maximum benefit of the funding. VISION – We strive to ensure that all pupils leaving our school are physically literate with the knowledge, skills and motivation necessary to lead a healthy lifestyle, and hopefully pursue a lifelong participation in physical activity and sports.